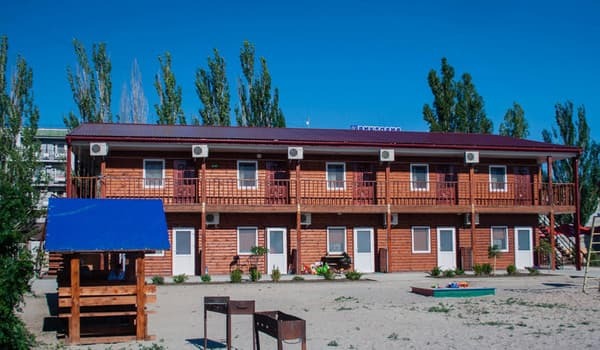 Near the Black Sea coast is a wonderful hotel "Koblevvo Marine". The case is made of a wooden frame, which meets the concept of recreational recreation. 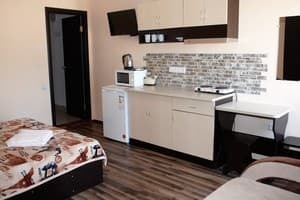 Rooms for holidaymakers are equipped with everything necessary for a cozy holiday - quality, modern renovation, air conditioning, furniture, television, unlimited wireless Internet, comfortable beds, a bathroom in the room, constant hot water. For family recreation, the hotel offers rooms with an equipped kitchen-studio. There is also a common kitchen for those who like cooking homemade food. All rooms have gas stoves, refrigerators and microwaves. 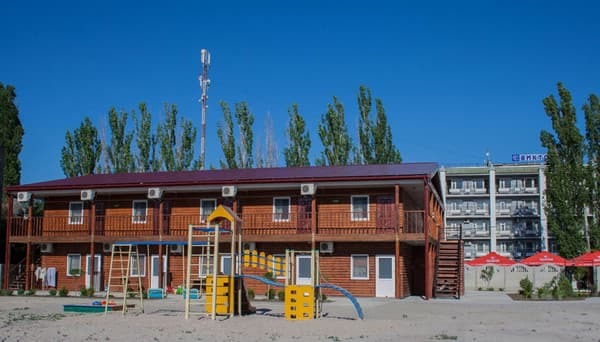 On the territory of the resort hotel there is a children's playground, a place and all the necessary attributes for cooking shish kebab are organized. The reception is open 24 hours a day. The road to the sandy beach takes no more than 2 minutes on foot. If guests arrived by private car, the hotel has a parking. The distance from Odessa is 38 km, from the international airport of Odessa about 45 km. The hotel administration organizes the transfer service. Description of the room: Gorgeous triple room with all amenities. The total area of the room is 25m2. 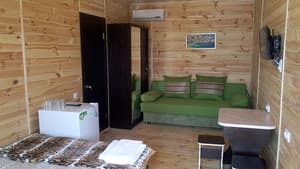 The room - a double bed and a single bed, air conditioning, refrigerator, LED TV, digital tuner, large bathroom with shower. Hot water - around the clock. The flooring is laminate, the walls are drywall. Possible to install additional space for an additional fee. Description of the room: Comfortable room, designed for a family of 4 people. 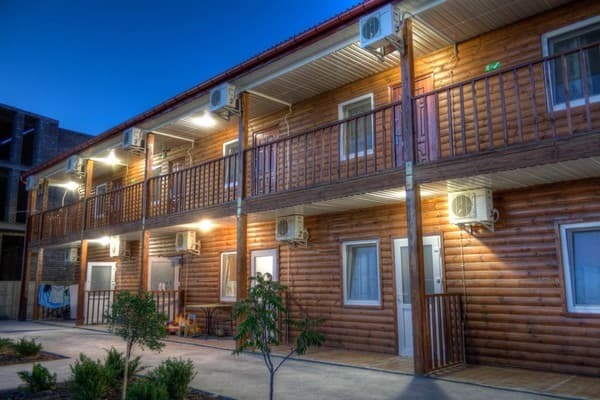 Amenities: - air conditioning; - flat TV; - digital tuner; - fridge; - double bed and a large sofa. Finishing rooms completely wooden. On the floor - batten. Hot water - around the clock. Description of the room: The studios have air conditioning, refrigerator, mini-kitchen, dishes, TV, tuner. Вигідне розміщення. Комфортно, чистенько.Приємний персонал..Дуже задоволені .Рекомендуємо. Check arrival: from 13:00 - 24:00 hours. Check leaving: to 07:00 - 11:00 hours. All children are welcome. Is free! Up to two children under 6 years stay free of charge when using existing bedding. All children under the age of 2 years are charged 50 UAH per night on cots. 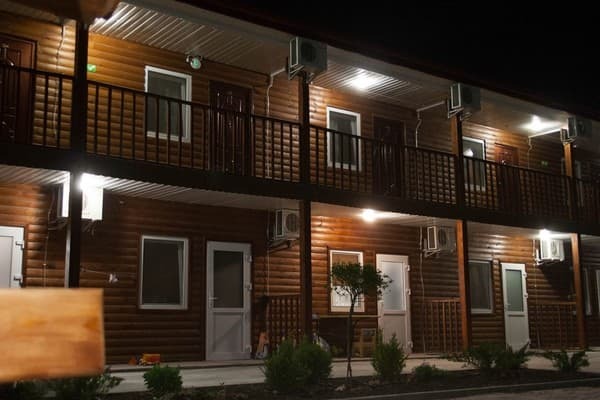 At an additional placing of all children of older age or adults on extra beds 150 UAH per night are charged. Maximum capacity of extra beds in a room is 1. Extra beds and baby cots are available on request. Need to be confirmed by the hotel for this service. 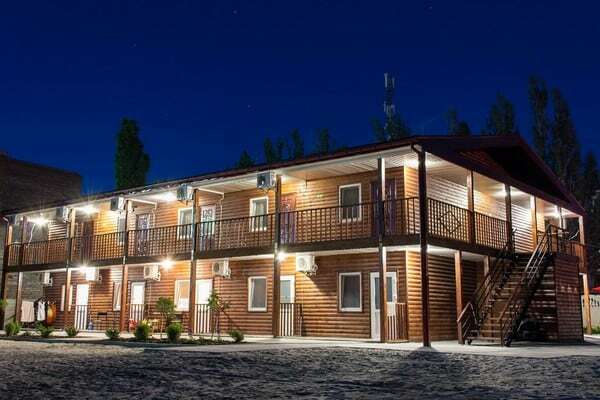 Additional services are not included automatically in the total cost and are paid separately during the stay. For family recreation, the hotel offers rooms with an equipped kitchen-studio. There is also a common kitchen for those who like cooking homemade food. The distance from Odessa is 38 km, from the international airport of Odessa about 45 km. The hotel administration organizes the transfer service.